To model clinical situations, we are using animals with skin structure and function similar to the human skin. Pig skin has many similarities to human skin, including histological appearance and wound healing ability. We are using Norwegian pigs (Norsk landsvin) with weight between 25 and 30 kg in our studies. Pairs of standardized symmetrical elliptical excisions are made on the truncus of the pig. These are compared to control excisions at the same location on the contralateral side. Microcirculation and histological measurements are performed to evaluate the effect of different reconstructive procedures or other interventions on wound healing. To investigate microcirculation and wound healing in an isolated setting, we use rat models as described below. Dissection of the perforator flaps preserves the muscle and minimizes the donor site morbidity. Nevertheless, the method may have undesirable effects on the muscle because of damage of its innervation, blood supply or by direct injury when dissecting the perforator. This damage can be reduced by including a minimum number of perforators. However, a reduced number of perforators may be detrimental to the flap viability and wound strength. To study the effect of different numbers of perforators in a lipocutaneous flap we are using Wistar rats where two symmetrical abdominal lipocutaneous flaps are raised around the midline. On one side all major perforators of the flap are left intact and on the other side only the largest perforator is retained within the flap. After dissection, the flaps are fixed to the original position by a continuous suture. Microcirculation, flap viability, wound strength and histological changes are measured preoperatively and during the first week after the operation. As flap vitality should be related to an adequate circulation, a low number of perforators may dispose for ischemia and necrosis. Although our data suggest this, the difference in skin vitality between multiple-based perforator flaps and single-based flaps is not significant. However, minor disturbances in microcirculation, which does not affect the flap viability can interfere with normal metabolism and wound healing. In our model this has been confirmed with elevated wound strength in the multiple-based perforator flap. We found no reduction in the microcirculation, compared to the preoperative measurements, in the single-based perforator flap. However, the multiple-based perforator flap showed a significant reactive hyperaemic response during the first 2 hours after dissection compared to the singlebased perforator flap. This finding is probably caused by the release of histamine, serotonin and bradykinin etc., seen in early inflammation, and resulting in vasodilatation. The lack of this response in the single-based perforator flap may be explained by the counteracting effect on the microcirculation by dividing the supernumerary perforators. Normal wound healing is associated with an enhanced microcirculation; supplying this delivers the nutrients, cells and growth factors necessary to complete the wound healing process. The absence of this reactive response may give unsatisfactory wound healing which can be one of the reasons for the reduced wound strength in the single-based perforator flaps shown in one of our studies. In a clinical setting these findings may support the use of only one perforator to minimize the donor site morbidity. Nevertheless, in a patient with high risk of vascular complications, multiple-based perforator flaps may give an additional microcircular blood perfusion. Figure 3. 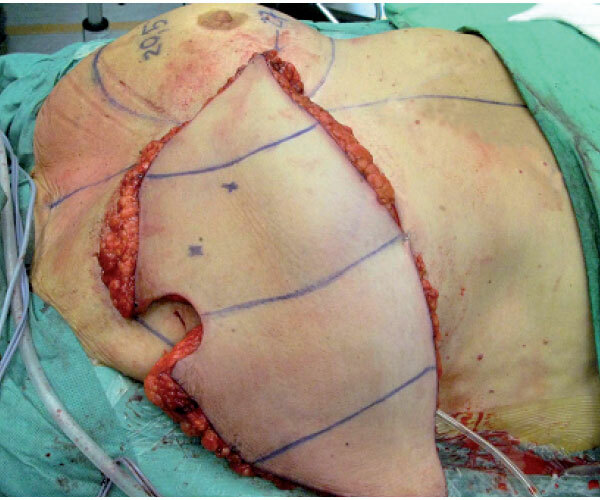 The abdominal flap is transposed to the thorax and is ready for revascularization. To continue improvements in both a clinical and scientific setting research using animal models is important. The groin flap based on the superficial inferior epigastric artery (SIEA) is well described. However, as shown in our previous research there are problems with autocannibalism. In addition, postoperative flap monitoring is difficult when the flap is translocated to the abdominal side of the animal. Protective methods have been developed with suboptimal results. A few studies have addressed these problems by transferring the flap to the dorsum of the rat. However, in these experiments the femoral vessels were ligated, with danger of an ischemic limb and possible tissue necrosis. The ischemic tissue may release factors that affect the microcirculation of the free flap. We have established a new SIEA flap model in the rat with good conditions for flap monitoring, without danger of flap autocannibalisation and with preserved limb circulation. This model is used when performing studies on microcirculation and histological changes where we want to compare different interventions on the flap or the animal over a longer period of time. 3. Microcirculation and reinnervation in human perforator flaps. The deep inferior epigastric artery perforator (DIEAP) flap from the abdomen is one of the most suitable perforator flaps used for breast reconstruction. This procedure has had a significant impact on the field of plastic and reconstructive surgery, because of the high number of women requiring breast reconstruction after cancer surgery. Based on the experimental research and clinical experience, our group is performing investigations to optimize the reconstruction technique and to minimize the donor morbidity. Figure 4. Preoperative markings on the patient (left), and after breast reconstruction with DEIAP flap (right). Until now little attention has been paid to reinnervation of the flap. We have investigated the spontaneous reinnervation of the DIEAP flap after breast reconstruction. Pressure thresholds have been analysed on the skin island of the flap using Semmes-Weinstein monofilaments. The measurements has showed measurable sensation in >95% of the flaps. Approximately 30% of the patients have normal or diminished light touch in one or more areas. We have also found significant better pressure sensitivity when the medial was compared to the lateral side and the inferior to the superior side of the flap. Our data shows that DIEAP flaps reinnervate after breast reconstruction although there is no sensory nerve repair. We have also examined the pressure sensitivity at the donor site at the abdomen after breast reconstruction with DIEAP. In one of our studies significant higher pressure thresholds were found postoperatively in the DIEAP patients on both sides of the scar and in the midline from the scar to the umbilical level after the operation. Our data show that the abdominoplasty performed during breast reconstruction with DIEAP reduces cutaneous sensitivity at the donor site area. Histological studies to evaluate the reinnervation in skin are planned both for the perforator flaps and for the donor site. In another study a quantitative analysis of the microcirculation in the classic perfusion zones of the DIEAP flap has been performed. Data were recorded 10 minutes after successful microanastomosis. Our data, so far, show a significant lower perfusion in zone IV compared with the other zones. No difference was found comparing zone II and III. However, in 80% of the flaps the perfusion was higher in zone III. In light of our results we suggest a new perfusion model for the DIEAP flap where both zone II and III according to the classic model can occur as zone II. Measurements of microcirculation are a central part of all animal and human experiments. It is performed with a PIM 3.0 laser Doppler perfusion imager (LDPI) from Perimed, Stocholm, Sweden. The LDPI generates, processes and displays colour-coded images of tissue perfusion. An optical scanner guides a low power laser beam stepwise to the tissue surface. The LDPI measures microcirculation to a depth of a few hundred micrometers. When the laser beam hit moving erytrocytes in the subepidermal plexus the light is backscattered and detected by a photodetector, this convert the light intensity to electrical signals and colour-coded images.